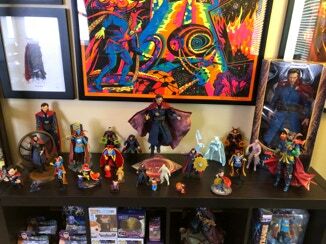 ﻿This ﻿section ﻿of ﻿the ﻿Archive ﻿features ﻿Doctor ﻿Strange ﻿action ﻿figures ﻿and ﻿figures. ﻿For ﻿the ﻿purpose ﻿of ﻿this ﻿site, ﻿action ﻿figures ﻿are ﻿figures ﻿that ﻿are ﻿articulated. ﻿For ﻿example ﻿arms ﻿and ﻿legs ﻿that ﻿move ﻿and ﻿can ﻿be ﻿posed. ﻿Figures ﻿are ﻿not ﻿articulated ﻿but ﻿are ﻿to ﻿small ﻿to ﻿be ﻿considered ﻿statues. ﻿The ﻿very ﻿first ﻿Doctor ﻿Strange ﻿action ﻿figure ﻿was ﻿the ﻿1996 ﻿Toy ﻿Biz ﻿Spider-Man ﻿Spider ﻿Wars ﻿Doctor ﻿Strange ﻿figure. ﻿It ﻿came ﻿with ﻿a ﻿thick ﻿plastic ﻿cape ﻿with ﻿a ﻿wire ﻿in ﻿the ﻿bottom ﻿and ﻿a ﻿waist ﻿clip. ﻿This ﻿allowed ﻿you ﻿to ﻿pose ﻿the ﻿figure ﻿as ﻿if ﻿it ﻿was ﻿flying ﻿off ﻿the ﻿ground ﻿by ﻿standing ﻿it ﻿on ﻿the ﻿base ﻿of ﻿the ﻿cape ﻿and ﻿raising ﻿the ﻿legs. ﻿Many ﻿other ﻿action ﻿figures ﻿have ﻿been ﻿released ﻿over ﻿the ﻿years ﻿in ﻿various ﻿sizes. ﻿One ﻿of ﻿my ﻿favorites ﻿is ﻿the ﻿Hot ﻿Toys ﻿1/6 ﻿scale ﻿Doctor ﻿Strange. ﻿It ﻿doesn’t ﻿get ﻿any ﻿better ﻿than ﻿that ﻿figure. ﻿This ﻿category ﻿also ﻿includes ﻿PoPs ﻿and ﻿Mini ﻿Mates ﻿since ﻿they ﻿do ﻿not ﻿really ﻿fit ﻿in ﻿any ﻿other ﻿category. ﻿Many ﻿non-articulated ﻿figures ﻿have ﻿also ﻿been ﻿released ﻿over ﻿the ﻿years. ﻿Some ﻿where ﻿released ﻿as ﻿part ﻿of ﻿Marvel ﻿magazines, ﻿Ben ﻿Cooper ﻿Jigglers ﻿(super ﻿creepy), ﻿Q-Figs, ﻿Doctor ﻿Strange ﻿Mr. ﻿Potato ﻿Head, ﻿etc. ﻿Some ﻿are ﻿made ﻿of ﻿plastic ﻿and ﻿some ﻿are ﻿made ﻿of ﻿metal. ﻿Since ﻿the ﻿release ﻿of ﻿the ﻿2016 ﻿Doctor ﻿Strange ﻿movie, ﻿many ﻿of ﻿the ﻿figures ﻿are ﻿sculpted ﻿after ﻿the ﻿movie ﻿version ﻿of ﻿Doctor ﻿Strange ﻿instead ﻿of ﻿the ﻿classic ﻿look. ﻿In ﻿recent ﻿years, ﻿you ﻿can ﻿also ﻿notice ﻿that ﻿many ﻿figures, ﻿action ﻿figures ﻿in ﻿particular, ﻿have ﻿reused ﻿the ﻿same ﻿molds ﻿or ﻿sculpts. ﻿They ﻿may ﻿be ﻿to ﻿different ﻿scales, ﻿but ﻿the ﻿sculpt ﻿is ﻿the ﻿same. ﻿In ﻿all ﻿honesty, ﻿its ﻿how ﻿a ﻿manufacturer ﻿can ﻿make ﻿more ﻿money ﻿and ﻿keep ﻿costs ﻿down, ﻿but ﻿for ﻿collections, ﻿its ﻿a ﻿bit ﻿redundant. ﻿This ﻿page ﻿only ﻿lists ﻿figures, ﻿for ﻿statues ﻿use ﻿the ﻿menu ﻿options ﻿above ﻿to ﻿navigate ﻿to ﻿the ﻿other ﻿pages. ﻿Enjoy!